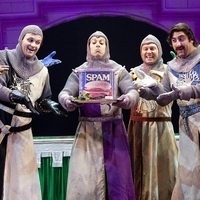 Winner of the 2005 Tony Award for Best Musical, Monty Python’s Spamalot is lovingly ripped off from the 1975 film classic, Monty Python and the Holy Grail, and tells the tale of King Arthur and his Knights of the Round Table as they embark on their quest to find the missing mythical Holy Grail. All of your favorite gags from the film find new life on stage, including flying cows, killer rabbits, and taunting Frenchmen in this Broadway musical that turns the genre on its head. $30.00. Discounts available for students, staff, and youth by calling (912) 478-7999.